The Music Den - Now offering free trial lessons! NOW OFFERING FREE TRIAL LESSONS! • We offer a FREE TRIAL LESSON so you can be sure ahead of time that you're satisfied with our service. 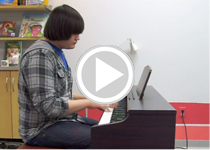 Come see for yourself the difference private instruction can make in your or your child's musical development! • There are NO HIDDEN FEES at The Music Den. Some studios charge large sums for things like multiple required recitals during the year, expensive and unnecessary required dress attire for recitals, large annual registration fees, etc. • WE HAVE CERTIFIED AND EXPERIENCED TEACHERS. Public schools require that their teachers have a college degree to teach - why would you settle for anything less for you or your child's music education? Interestingly enough though, MANY PUBLIC SCHOOL MUSIC TEACHERS HAVE NO MUSICAL BACKGROUND OR PREVIOUS EXPERIENCE WITH THE INSTRUMENT THEY ARE ACTUALLY TEACHING. This, coupled with large class sizes leads inevitably to a lower quality of individual education for your child. Never assume, always ask about your teacher's specific qualifications. If attending a private music studio, it's also a good idea to sit in on at least one of your child's lessons. If you're not allowed, why would you continue to go there? • Unlike a public school class, WE WORK ON SONGS AND MATERIAL THAT YOUR CHILDREN REALLY WANT TO LEARN, rather than songs they may not care about and mandated material that may not be necessary or effective for your child. We can tailor the lessons to fit you or your child's specific needs, interests and abilities. Think that a degree and experience aren't important? Think again! As just one example, a student can get a permanent case of Carpel Tunnel Syndrome from practicing the wrong way on many instruments. An educated and experienced teacher can show students how to avoid this fate. An instructor can still be effective without a degree, but the interviewer hiring such a candidate must be a certified, experienced teacher themselves to correctly identify qualified teaching applicants. Is your studio owner such an individual? We provide music instruction in Orlando and Apopka for all styles and skill levels, for music students age 4 and higher. Whether you’re looking for guitar lessons, electric bass lessons, drum/ percussion lessons, piano/ keyboard lessons, voice lessons, violin lessons, brass lessons, woodwind lessons, or banjo lessons, The Music Den is your number one choice! We are constantly adding instruments to our curriculum, so if you don’t see your instrument listed here, give us a call! See our Scheduling and Music Tuition pages for further information. Our Questions and Answers (Q & A) page may also be of some assistance with common questions that often arise about music lessons. For more information about our instructors, see our Instructors page. Customer satisfaction is our highest priority! So give us a call today and start down your path toward musical enrichment. Or better yet, schedule an appointment to drop by and check us out in person. See our Contact page for further information on how to contact us at The Music Den. Our Directions page may also be of use if you need directions to the store. The Music Den would like to extend a heartfelt thank you to all of our valued customers and supporters. Thanks for checking us out and we hope to hear from you soon!